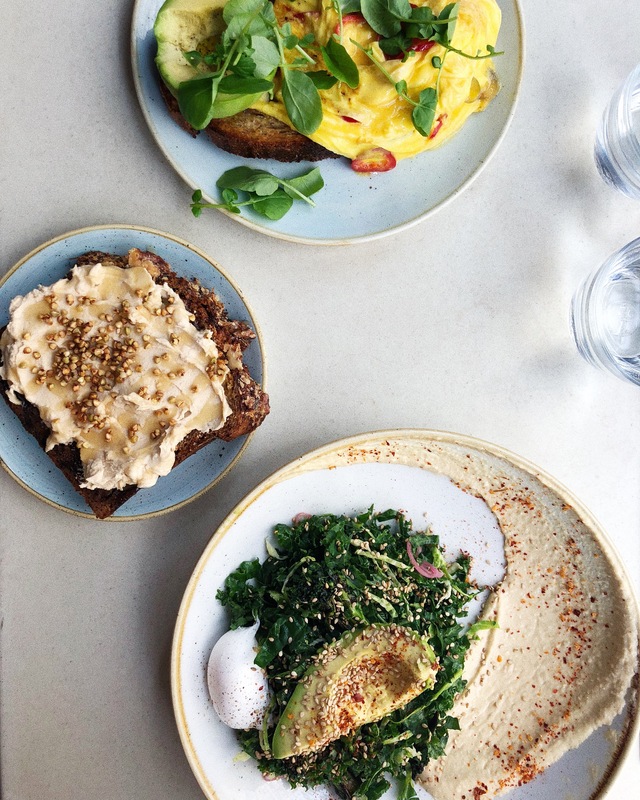 Since moving to New York I felt it was my duty to share my favourite healthy-ish spots to eat in the city. It would be selfish to keep these gems to myself. I divided the list into four categories: 1. brunch/lunch 2. Dinner. 3. Grab and Go 4. Misc. Most of the places I listed for lunch and brunch are also open for dinner. As well, a bunch of the dinner spots serve lunch/brunch, I just haven’t been during those times. I’m always looking for new places to eat so I will try to keep this list updated as I continue to explore the city. Let me know if you have any healthy-ish restaurant suggestions! Minimalist yet uber stylish interior with colourful and healthful dishes with global influences. Two locations, both bright and airy with hanging fruits, vegetables, and plants. This restaurant serves both vegan and vegetarian options and an array of juices. Seasonal, local, organic and healthy dishes in a beautiful space. Snug yet cool space with healthy yet indulgent dishes such as matcha buttermilk pancakes and acai bowls. Aussie expat restaurant with a bright interior and ‘beachy’ vibes. Dishes are beautiful as much as they are nourishing. A cool and relaxed vegetarian all-day cafe founded by Los Angeles natives. The restaurant isn’t overly healthy but focuses more on good quality food. Israeli food with New York inspiration with global locations such as in Tel Aviv and Paris. A variety of creatively stuffed pitas and vegetables. My go to: The ratatouille pita and the famous baby cauliflower. A trip to New York isn’t complete without a bagel and lox. Sadelle’s is a gorgeous space with the best everything gluten-free bagels and smoked salmon towers. A hippy dippy macrobiotic restaurant that serves warming nutrient dense dishes. Jean-Georges absolutely perfect plant-based restaurant. An all white interior with pops of colour and beautiful tableware. The dishes are exquisite and delicious. It’s my favourite place to eat in NY. My go to: Dosa with coconut yogurt, avocado, and sprouts, fried wild rice, whole roasted cauliflower, and any of the desserts. Nix is a Michelin Starred chic restaurant with an entirely vegetarian menu. The space is pretty and the menu is exciting. An upscale restaurant that thrives on local and seasonal ingredients. All types of eaters would enjoy dining at this restaurant. Many items are cooked over fire. A cosy Italian restaurant with the most delicious pizza. Not the healthiest option but an NYC eating guide wouldn’t be complete without a pizza recommendation. Super hip Vietnamese street food spot. The meats are grass-fed and the chickens are pasture-raised. A vegan noodle soup is also on the menu. Do you ever feel like home-cooked food but you’re too busy or lazy to cook? Westville is your answer. A no-frills, order what you love spot. I like this place because of it’s extensive list of vegetable offerings. Location: West Village, East Village, Chelsea, Hudson, Dumbo, Wall St.
A farm to table Italian restaurant that specializes in gluten-free dishes. It’s known for it’s gluten-free thin crust pizza. Chinese food and healthy eating doesn’t go hand in hand in many people’s minds. I disagree. Chinese restaurants have the best vegetables. Cafe China offers many healthy options with vegan and gluten-free options. It’s a popular spot that doesn’t take reservations so arriving early is recommended. It’s probably my favourite restaurant in the city. My go to: Kung fu shrimp, kung pao chicken, ma po tofu, bok choy with garlic, snow pea leaves with garlic, brown rice. A seasonal, sustainable café with hearty options and creative vegetables dishes. My go to: Baharat roast chicken, sweet potato noodles, and any vegetable. Organic Paleo prepared foods with endless breakfast, lunch, dinner, and dessert options. It’s a paleo lovers heaven. My go to: Organic stuffed portobello mushroom with sweet potato, almond crusted chicken fingers, and HU crunchy mint chocolate bar. Wholesome food for your lunch break. Make your own boxes with whole grains, local proteins, and seasonal inventive vegetable dishes. My go to: spirulina-flecked brown rice, grilled avocado, turmeric tahini, and whatever vegetable I am feeling that day. Vegan comfort food such as burgers, mac n’ cheese, air-baked french fries and kale caeser salad. NYC salad empire that offers make your own salad and grain bowls with sustainable ingredients. My go to: kale and romaine, avocado, roasted sweet potatoes, cucumber, carrots, chickpeas, seeds, and miso sesame ginger vinaigrette or spicy cashew dressing. Location: too many to list! A spot specializing a variety of nutritious soup broths, such as free-range chicken, grass-feed beef broth, and vegetarian. Broths may include healthy add-ons such as turmeric, grass-fed butter, collagen protein, and kimchi juice. Colourful,innovative, and healthy Indian bowls. The menu consists of a nourishing and flavourful bowls. The menu is entirely gluten-free. Casual takeout pizza place with the best vegan gluten-free pizza. My go to: V is for vegan on gluten-free crust. Artichokes, red onions, shiitake mushrooms, red pepper and basil pesto, and daiya cheese. Location: East Village, West Village, Midtown East, Hells Kitchen, Upper East Side, Upper West Side, Williamsburg, Park Slope. A café serving Instagram worthy superfood latte’s. Ingredients include matcha, beetroot, turmeric, blue algae, and activated charcoal, as well as an array of nut milks. My go to: Rainbow iced latte- a tri-coloured drink with beetroot, blue algae, turmeric, coconut sugar, vanilla bean, black pepper, cayenne pepper, agave, and a blend of almond, coconut, and oak milk. An artisan ice cream shop that serves both regular and vegan ice cream. Their vegan ice cream is the finest in the land, made from both coconut and cashew milk. A health-food store that sells home-made raw, vegan, and gluten-free desserts. Just head to the fresh food area in the back. A fun spot with quirky decor specializing in hot and cold matcha lattes. Tea ranges from regular to chai matcha, ginger turmeric, and white chocolate with many nut milk options. Matcha soft serve and pastries are also available. This entry was posted in Lifestyle and tagged guide, healthy, Lifestyle, NYC, Restaurants, Travel. Bookmark the permalink.